I have some very good news. 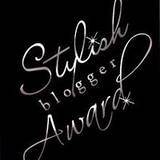 Gloria from Girlia's Cards sent me a stylish blog award. There are some requirements that comes with this award. Upon receiving this award I must thank the person (s) and link it back to their blog, inform all the new recipients of their award, and share 8 things about myself. Pass it on to 8 individuals (blogs) that you recently discovered. I want to say thank you so much to Gloria for seeing something special in my blog. When I saw that I had a blog award, I got a warm fuzzy feeling inside. Upon receiving this award I must thank the person (s) and link it back to their blog, inform all the new recipients of their award, and share 8 things about myself. Pass it on to 8 individuals (blogs) that you recently discovered. I would like to pass this fun award and recognize these 8 individuals. I have to say...it is not easy to choose because each and every one of us are talented and creative in this paper craft that we enjoy. This is in no particular order. Congratulations! 2. My daughter is my world. 3. I discovered stamping about 6 months ago. 4. I have had a cricut machine since January 2010. 5. I want to go to Puerto Rico one day. 8. I am very addicted to Pepsi. Thank you for the award! Another first on my day of firsts!!! I'm so new to blogging, I don't know how to add the button to my sidebar. Can you help me with that? I'll be happy to continue spreading the love once I get this figured out. Thanks again! @ Christy - What I did was save a copy of the picture and then went into the add the gadget, chose the picture option and uploaded the image. Thanks so much for the award! I really appreciate it! It's my first! I'm off to figure out "how" to do this now! LOL. THank you! Congratulations on your award and thank you for awarding it to me.